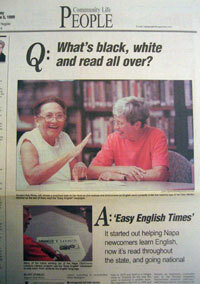 Easy English Times: Your ESL and adult literacy newspaper! A newspaper in easy English! Are you learning English as a second language (ESL)? Are you teaching ESL, adult literacy or citizenship? Would you like a free sample copy (USA only)? Email us at easyenglish@aol.com with your USA mailing address and we will send you a hard copy newspaper as a sample. Short term orders are available. Earth Day is April 22. Members of the younger generation are fighting for environmental issues. There is a lawsuit called "Juliana v. the United States" that is still active. Students around the world protested climate change during marches on March 15. A 16-year-old from Sweden was nominated for a Nobel Peace Prize for her environmental efforts. Two sisters worked to ban plastic bags in Bali and were successful. Think globally, act locally was the message at a talk on climate change. What we can each do to fight global warming? Information is included on recycling and taking public transportation. April is Poetry Month. National Library Week is April 7-13. National Park Week is April 20-28. What is an intaglio? When is a rock not a rock (answer: when it is a "weatherman")! What is a cairn? Sports stories are on rock climbing, baseball and running. Easter is April 21. Family literacy is a play to read with children, "Peter Rabbit." Financial literacy provides information on check cashing centers. American history is on the Donner Party and on Paul Revere's ride. Citizenship questions are related to stories in this issue. There are many instant activities including idioms. Our readers write from Chicago and California on several different topics. A move review is included. All this and more in the April issue. Student writing of the month is from the Pui Tak Center in Chicago. Bonus student writing is from the Sonoma County Library Adult Literacy Program in California. NEW - A pre-crossword puzzle worksheet is available to give your students additional practice! NEW - Answer keys are now posted for Learning Activities and can be printed out! Help celebrate our 20th anniversary! 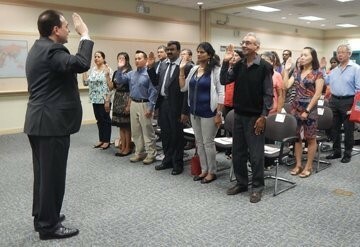 Above, Mark Farfaglia of the USCIS San Francisco Field Office, administers the oath to 24 new citizens from 11 countries at a citizenship ceremony. It was held in Fremont, California at the library there on Aug. 2, 2016. We love to print student writing! Every month we receive more student writing than we have room to print so we are featuring a few more stories here under "Bonus Student Writing." Also see "Student Writing of the Month." It is our hope that you will start by reading this newspaper then "graduate" on to reading community newspapers. In a past issue... Why should you "Wear Red for Adult Ed"? 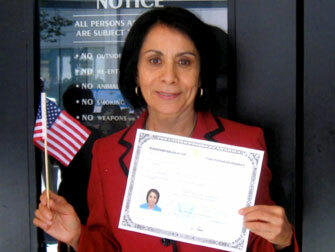 Learn why and see the story and photographs of California ESL students and a teacher wearing red. (Click HERE for a special copy of the complete story and additional photographs.) Pictured here above, students from San Mateo Adult School in California. "Adult Education Matters" is the message on the red shirts. 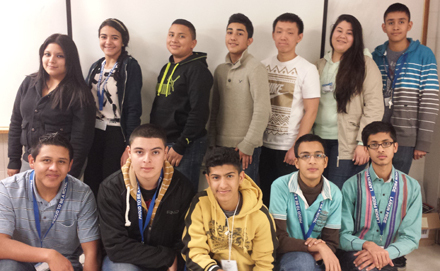 Above, we salute student writers from Larkin High School, Elgin, Illinois. Short-term orders are available. Email us about bulk discounts at easyenglish@aol.com. You can walk into the classroom and start teaching from the paper. Do you want tips on using any newspaper in your class (also useful for tutors)? Click here. A Teachers' Corner is included. Easy English Times has instant activities for reading, writing and conversation. This newspaper is published to present relevant information and current events in an easy to read format for English language learners and adult literacy programs. Easy English Times can be used in multi-level ESL or adult literacy classes. Do you need easy content for beginning readers? See page 3 of each issue for "Easy, Easy English." Citizenship - Easy English Times has a focus on citizenship! Citizenship information is included in each issue. 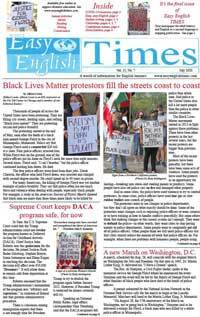 Easy English Times brings a world of information to high school and adult learners. It's a newspaper written in easy English for those in English as a second language (ESL) classes and adult literacy programs. It is used in library and workplace literacy projects. It is used in jail and prison literacy programs. Published 10 times a year, Easy English Times is used in ESL classes in high schools, adult schools, colleges and other sites. It is used in family literacy projects. It is used by English as a second language (ESL) teachers and literacy tutors. 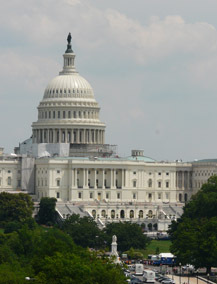 It is used in citizenship classes and EL Civics programs. It is also used in EFL classes. Classroom and individual subscriptions are available. Discounts are given for class sets. We accept school purchase orders and credit card payments. You can order this English as a second language (ESL) and adult literacy newspaper by mail, by the issue or by the year (10 issues). Contact us for international mail rates. We have added an online edition, especially for the convenience of international readers. Subscribe today to Easy English Times. Desea usted mejorar su ingles? Subscriba hoy a Easy English Times.